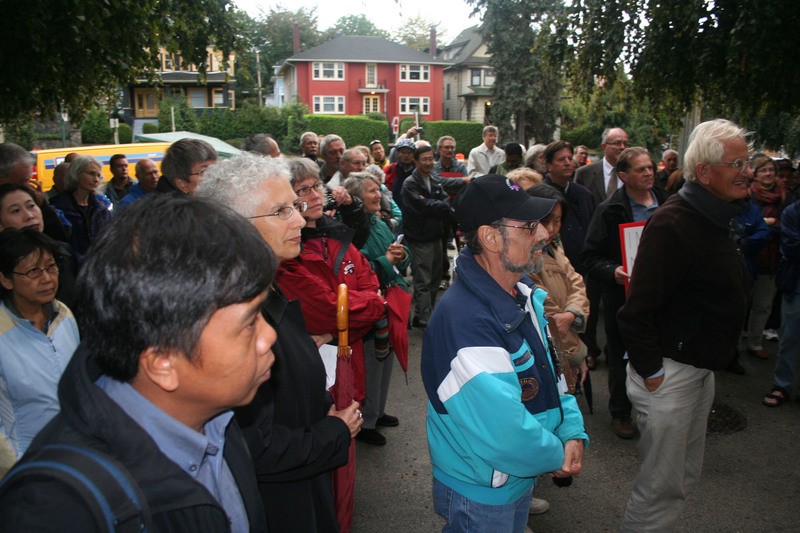 NOTE: Norquay Neighbours functioned as a community-based action group from June 2007 into the first half of 2009. A portion of the Norquay Neighbours group decided to engage in the second round of Norquay planning, which began with a 29 November 2008 open house event. Others decided to steer clear of involvement in further city-controlled “process.” As a result, this Norquay Neighbours web site went dormant early in 2009. Throughout 2009-2010, communication within the Norquay community relied on email contact only. In November 2010, planners and Council imposed a plan on Norquay despite a lack of substantial community support. In February 2011 a successor web site came into being to complement and to update the Norquay Neighbours site. Eye on Norquay records what has taken place after 2008, monitors what is happening to the Norquay area of East Vancouver, and provides an ongoing forum for residents to communicate. This web site is devoted to providing background, current information, and links related to what the City of Vancouver has chosen to call the “Norquay” area of East Vancouver (see Norquay Maps). A handy readable summary of specific major concerns 2007-2008 can be found in the first issue of Norquay Newsletter published in Fall 2008. Things Norquay Neighbours Are Doing lists our actions, with upcoming and latest at the top. Contact with other neighborhood groups across Vancouver led us to believe that we stood in the front line of resistance to a hastily conceived and ill-considered attempt to remake the city of Vancouver without proper citizen consultation. Please spend time reviewing the following material and support us in our attempts to engage the City of Vancouver. About 2400 single-family homes fall within the Norquay area. The Norquay area extends 1.35 km along Kingsway from Gladstone Street to Killarney Street, reaches as far north as East 24th Avenue and as far south as East 41st Avenue, and straddles the Nanaimo Street boundary between Renfrew Collingwood and Kensington Cedar Cottage. This two-sided half-sheet pdf was distributed as a leaflet to visitors to City Planning’s Nov. 29, 2008 Open House about upcoming neighbourhood centre planning in Norquay. This four-page pdf was distributed by hand as a print publication to some 2400 homes in and near Norquay. It offers a handy summary of recent history and some results of research. A restart of neighbourhood centre planning for Norquay Village after an eighteen-month suspension occasioned the preparation of this first issue. This document outlines issues of scope, method, context, process, timing, and transparency related to the City of Vancouver’s resumption of one-sided planning for Norquay Village in June 2008. This two-page leaflet announces a city-wide rally on Tuesday June 10, 2008 at 1:30 p.m. at Vancouver City Hall. This two-page leaflet announces a city-wide rally on Tuesday February 26, 2008 at 7:00 p.m. at Vancouver City Hall. This account shows how the City of Vancouver discarded unwanted feedback from the Norquay community. This two-page leaflet raises many serious questions about the City of Vancouver’s proposals for EcoDensity. This two-page leaflet announces a public forum on rezoning in Norquay, to be held on Friday October 19, 2007 at 6:30 p.m. at Collingwood Neighbourhood House, 5288 Joyce Street (near Joyce skytrain station). This detailed statement, released in October 2007, embodies much consultation with citizens resident in Norquay as well as input from citizens in other neighborhoods across Vancouver. This August 20 press release coordinates with the following leaflet that is already being distributed. This two-page leaflet calls for a rally at City Hall on September 18, 2007 at 6:30 p.m. by concerned citizens from across Vancouver. Norquay Neighbours seeks broad support in this action. This information is revised from an email with attached documents that was distributed starting July 16, 2007 – before Norquay Neighbours had a web site. The pdf attachments to the email have been replaced by links to relevant contexts on the City of Vancouver web site. This earlier version overlaps considerably with the other documents listed here, but it offers a view that may remain helpful. This document will not be updated. Although available at the November 29, 2008 Norquay Village Open House, this form was not on the literature table and was hard to find. Download a copy, fill out the form, and send it in so you can participate in a “working group” in the first half of 2009. Don’t let the City plan the long-term future of our neighborhood WITHOUT YOU. See detailed response to Newsletter no. 4: Newsletter no. 4 (June 19, 2008) : Norquay Village Neighbourhood Centre Program – A Preliminary Response. Newsletter no. 5 announced the Nov. 29, 2008 Open House at which a vague process was outlined, to include the restart of “working groups” and the holding of three Spring 2009 Workshops (with no dates set). This twelve-page brochure was distributed in late May and early June 2007 as an unaddressed junk mail flyer to many (but not all) houses in and near the affected area. The 30% of Norquay that does not have English or Chinese as a first language was given no indication of the importance of this information. Taken together with the map, this statement suggests that the City of Vancouver has targeted low-income households in the Norquay area for displacement. This one-page pdf map identifies 19 areas in Vancouver as targets for mass rezoning. This City of Vancouver report of June 2007 names Hastings Sunrise North and Main Street Riley Park as targets for 2008. Under Summary, the report indicates undue haste, using words like “expedite” and “faster.” This report also verifies – contrary to statements from Director of City Planning Brent Toderian – that an undiscussed, unapproved EcoDensity agenda hijacked the Draft Plan for Norquay. “EcoDensity is already influencing Centres planning, as exemplified by the review of new housing potential along Kingsway in the Norquay Village planning process” (p. 5). This report is simultaneous with distribution of the survey form in Norquay. This document provides evidence of poor planning for property tax impacts despite the extended – not expedited – process for rezoning Kingsway & Knight. It seems that the City of Vancouver is trying to implement EcoDensity ideas under the already existing Neighbourhood Centres Program without broad discussion or neighborhood consultation and with no respect for process or for the existing Community Vision of Renfrew-Collingwood.